My mother tongue is no longer my own. It has been a gradual weaning process, a wearing down of habits and familiarities, a calibration of practice and experience, heritage and circumstance. I feel like a foreigner in my country of origin—and have been told I sound like one too, by my grandmother no less. No one can place the accent of my adopted first language, English: Irish-Canadian is the most common assumption, yet I have never been to Canada. It is the potential within and between fragments that attracts me to the relationship between language and film, no doubt in part due to my own fractured lingual experiences. In Memory and the Moving Image: French Film in the Digital Era, Isabelle McNeill proposes, ‘fragments, debris, quotations: these markers of the past stick out, foregrounding the mnemonic Textual operations of film, which is to say the constant intertextual referencing and triggering of the spectator’s memory.’  Here the role of the reader, or spectator, is clear. The fragments allow and call for the viewer to ‘fill in the blanks’, using the faculty of their own memory to draw from an array of accumulated sources. The influence of Barthes’ concept of intertextuality is clear (not to mention Umberto Eco’s The Role of the Reader ). As Graham Allen describes in Intertextuality : ‘the modern scriptor, when s/he writes, is always already in a process of reading and re-writing. Meaning comes not from the author but from language viewed intertextually.’  I can’t help but be reminded of the opening sequence of Chris Marker’s Sans Soleil, one of my own creative refuges. McNeill writes, paraphrasing Deleuze: ‘though the filmic image is a supple mass, it is also “formed semiotically, aesthetically and pragmatically.”’  She suggests that Barthes’ concept of the Text ‘seen in terms of an active encounter with a web of citation’  can be, and should be, extended to film, specifically as an ‘encounter between personal and cultural memory’ . She makes reference to Barthes’ phrase ‘espace a dimensions multiples ’ (a multidimensional space), arguing that film is inherently a more capable example of intertextuality than writing due to it’s multi-sensory, audiovisual composition. But what takes place in the collision, or collusion, between text and film? ‘Every film is a foreign film,’rsquo;  reads the opening line in the introduction to Atom Egoyan and Ian Balfour’s collection of essays, Subtitles: on the foreignness of film . Initially striking me as a jarringly reductive observation, this statement begins to ring true the more I think about it. It could be rephrased as ‘everyone is a foreigner’. Or perhaps, ‘everyone is an outsider’. In an interview with Egoyan, filmmaker Claire Denis describes her fascination with cinema’s ability to highlight this sense of otherness, referring specifically to the relationship between film and exile. As she states, ‘there must be, in a film, a certain distance, so that you have to step into it.’  The experience of watching a film is grounded by a continual negotiation of the viewer’s position in relation to what they are seeing. It involves a curiosity that is not unlike that of a (time) traveller. In Barthes’ confrontation of a foreign culture, he recognises a moment of liberation in the ‘emptiness of language’. A degree of obfuscation elicits the imagination. In the early 90s, a social movement called ‘fansub’ emerged. It was initiated by fans of anime who hoped to popularise it outside of Japan, and offered foreign fans the opportunity to watch series and films which had not yet officially been translated. Fansubbing is a collective effort, with numerous people transcribing, translating, timing and editing these fan-produced subtitles for free. As most of the translators involved in the English translations are non-native English speakers, the final subtitles offer quite an interesting insight into the process of translation in relation to film. Fansubs are generally perceived as unreliable subtitles, though they tend to be available prior to any official foreign release. The fact that the subtitles are provided by amateur aficionados is a literal example of the role of the reader in the interpretation of film as Text. Professional subtitler Henri Béhar writes, ‘subtitling is a form of cultural ventriloquism, and the focus must remain on the puppet, not the puppeteer. Our task as subtitlers is to create subliminal subtitles so in sync with the mood and rhythm of the movie that the audience isn’t even aware it is reading. We want not to be noticed.’  By contrast, a viewer of fansubbed films can’t help but notice even if, or especially when, a concerted effort is made to integrate the subtitle as an aesthetic and cultural extension of the animation. 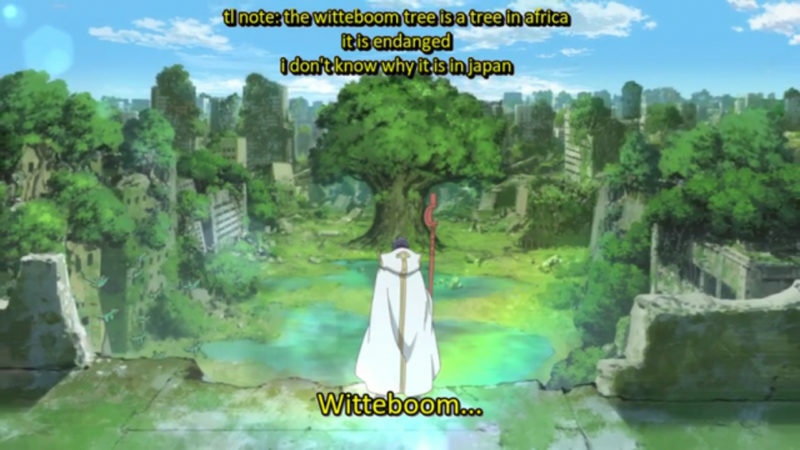 For example, fansubbers often employ ‘translator notes’ to explain, in varying detail, any references made to specific cultural phenomena in the anime that may be too obscure for a viewer from a different culture to understand at face value. 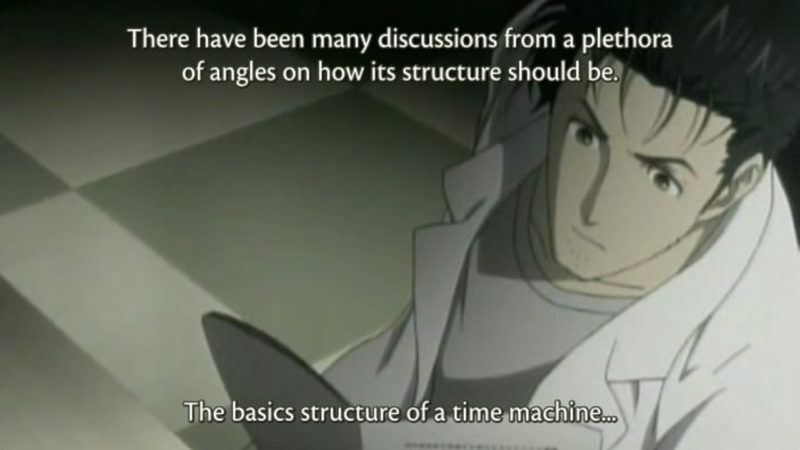 Translator notes appear alongside the subtitles (usually aligned to the top of the screen), and in some instances obscure the animation completely depending on the length of the explanation provided. Although the translator notes impede a natural reading of the anime through the obstruction of the visual narrative, they do provide necessary contextual information for the viewer without a literal transformation of the subject matter into cultural reference points relevant to the target audience. The subtitles—and translator notes—become an intrinsic aesthetic part of watching anime for anyone who isn’t Japanese (unless you opt for a dubbed version). Yet they further demonstrate the dual position of the viewer as both an involved reader and an exiled observer. 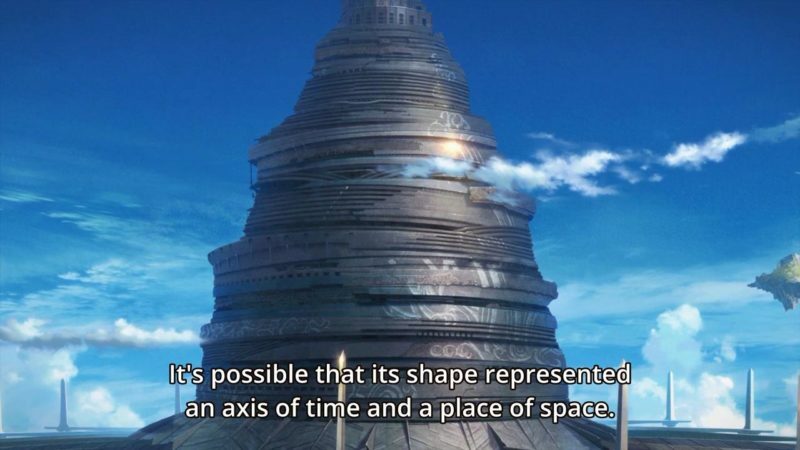 Different fansubbing groups have unique approaches to their art; some are known for their accuracy, others renowned for their visually innovative approaches. 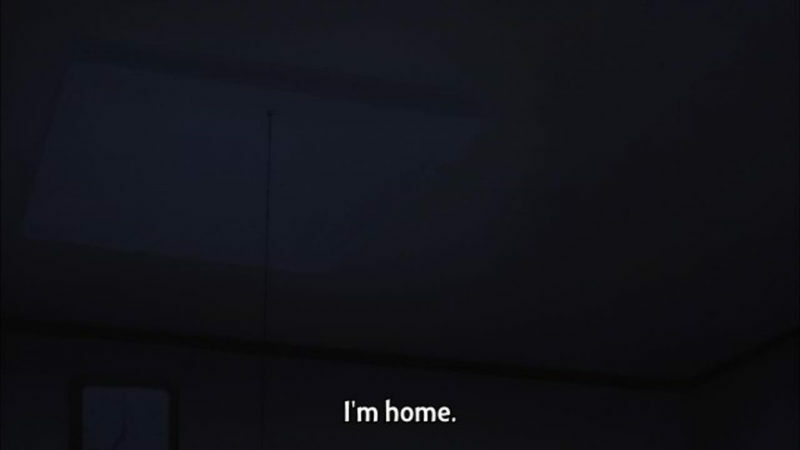 Some fansubbers even animate their subtitles, making them responsive to the action on screen, interacting with character movements (a kineticism which is also seen in Patricia Rozema’s film ‘Desperanto ’, in which an Anglo-Canadian woman conjures up subtitles for her enjoyment at a francophone party). This is in stark contrast to the norm of static subtitles: in Multilingualism in the Movies, Lukas Bleichenbacher explains that subtitles ‘are added to the cinematic text for the benefit of the viewer only and have no reality for the characters within the story’ . To meddle with this relationship would be an even stronger form of what he refers to as ‘narrative intervention’, creating a fluidity between the characters on screen, the subtitles and the participation of the reader. There are websites dedicated to comparing and rating fansubs for particular titles, such as www.crymore.net. 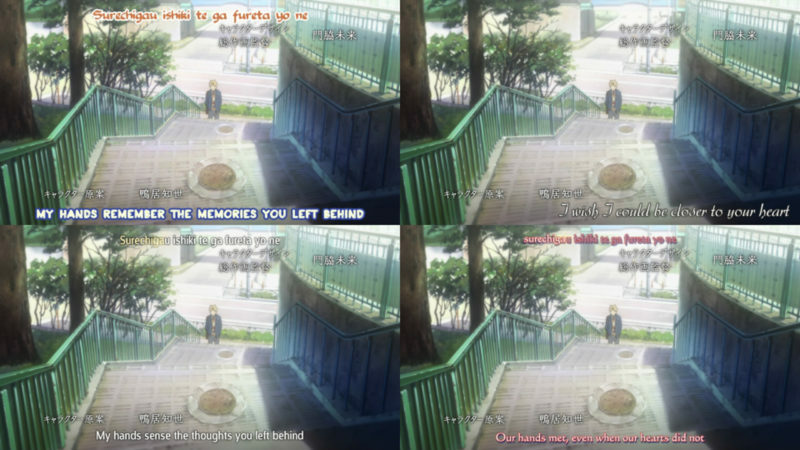 Below is a comparison of four different translations of the same scene in Kyoukai no Kanata. Eco writes, ‘text is a lazy machinery which forces its possible readers to do a part of its textual work, but the modalities of the interpretive operations—albeit multiple, and possibly infinite—are by no means indefinite and must be recognized as imposed by the semiotic strategies displayed by the text.’ The overlaps in the translations both demonstrate the parameters set by the source material, yet also reveal the subjective transformative power of the fansubber. Besides the evident polyvalence in the translations, each set of subtitles makes use of a different font, size and colour, further highlighting the aesthetic potentials of the text as an active, creative, readerly element within anime . Translation from one language to another is an interpretative balancing act. The designation of a source and target culture implies a disparity which can’t be fully bridged even through the most valiant attempts of translation. There will always be a fracture, involving the reader’s personal and cultural memory. As Denis articulates in her appraisal of cinema’s appeal, the reader will find her/himself an outsider, gravitating towards the familiar and recognisable within the alien and unknowable. The dark space between the source material and its translation reminds me of a passage in In Praise of Shadows, in which Junichiro Tanizaki describes the enigmatic potency of the traditional alcove in Japanese interiors: ‘The ‘mysterious Orient’ of which Westerners speak probably refers to the uncanny silence of these dark spaces. […] Where lies the key to this mystery? Ultimately it is the magic of shadows. Were the shadows to be banished from its corners, the alcove would in that instant revert to mere void.’  The shadows cast between languages, reveal the precarious nature of the transformation between source Text and its translation, much like the relationship between text and image. There is always something lost and gained in the gaps. This ‘poignancy of things’ is reminiscent of Barthes’ use of the word jouissance, a term Richard Howard points out isn’t available to us in English: ‘pleasure is a state, of course, bliss (jouissance ) an action, and both of them, in our culture, are held to be unspeakable, beyond words.’  The unspeakable pleasure of the text, the untranslatable, allows the reader to enter into a ‘communion’ of sorts with the other. Perhaps it is this silent secret which lies at the heart of the potency of the relationship between text and the moving image; at once divisive and unifying, it creates a space for the viewer to piece together meaning from their own ‘innumerable centres of culture’, a space to read into the dark. Orban, Clara Elizabeth, (1997). Culture of Fragments: Words and Images in Futurism and Surrealism . Amsterdam: Editions Rodopi B.V.. p. 21. McNeill, Isabelle, (2012). Memory and the Moving Image: French Film in the Digital Era. Edinburgh: Edinburgh University Press Ltd. p. 49. Allen, Graham, (2011). Intertextuality . Abingdon: Routledge. p. 72. McNeill, Isabelle, (2012). Memory and the Moving Image: French Film in the Digital Era. Edinburgh: Edinburgh University Press Ltd. p. 45. Egoyan, Atom and Ian Balfour (eds. ), (2004). Subtitles: on the foreignness of film . Massachussetts: Massachussetts Institute of Technology and Alphabet City Media, Inc. p. 21. Denis, Claire and Atom Egoyan, ‘Outside Myself’ in Egoyan, Atom and Ian Balfour (eds. ), (2004). Subtitles: on the foreignness of film . Massachussetts: Massachussetts Institute of Technology and Alphabet City Media, Inc. p. 76. Barthes, Roland, (1992). Empire of Signs . Noonday Press. p.6. Eco, Umberto, (2008). Experiences in Translation. London: University of Toronto Press Ltd. p. 17. Béhar, Henri, ‘Cultural Ventriloquism’ in Egoyan, Atom and Ian Balfour (eds. ), (2004). Subtitles: on the foreignness of film . Massachussetts: Massachussetts Institute of Technology and Alphabet City Media, Inc. p. 85. Eco, Umberto, (2008). Experiences in Translation. London: University of Toronto Press Ltd. p. 22. Bleichenbacher, Lukas (2008). Multilingualism in the Movies . Tubingen: Narr Francke Attempto Verlag GmbH & Co. p. 175. Tanizaki, Junichiro, (2001). In Praise of Shadows . London: Vintage. p. 33. Howard, Richard, ‘A Note on the Text’ in Barthes, Roland, (1998) Pleasure of the Text . New York: Hill and Wang. p. vi.